Did you run the “macosx-setup-command” that RXTX Java serial library requires? (Instructions are in the About box) After you run that command, you may need to reboot too. Have you tried using the RooStick on the PC after using it on the Mac? If not, try that known-good configuration again. Perhaps something happened to the RooStick or the Roomba. Can someone help me to get this program working on OSX 10.4.6 and a RooStick to connect to the Roomba. couldn’t read Roomba. Is it connected? Roomba is connected and updated with Osmo/Hacker. On a PC it does work (with other program). Please advice, what do i forget to do? That Pacman sound was really inspirating – hack it to play an actual Pacman: place pieces of dirt (corn for example) on the floor and play pacman on screen syncing with Roomba. And now, to play the National Anthem to kick off the 2nd Annual Philadelphia Roomba fight, the Roomba Symphony Orchestra. See, this is a useful app. It should be easy to port it to Windows. The code is 100% Java. 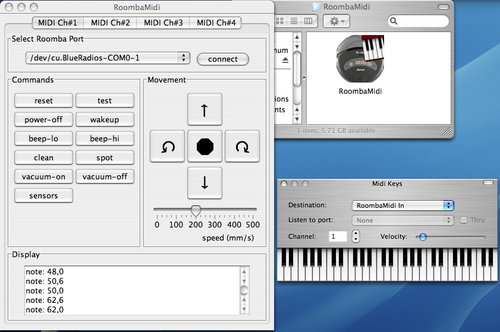 It does use OS X specific Java classes to create MIDI virtual destinations (which isn’t normally possible in the javax.sound.midi API). If there exists a Java class to create Windows virtual MIDI destinations, then the port would take about an hour. Can you make it windows compatible? i really want to hear it play smoke on the water! Great job with the hack! 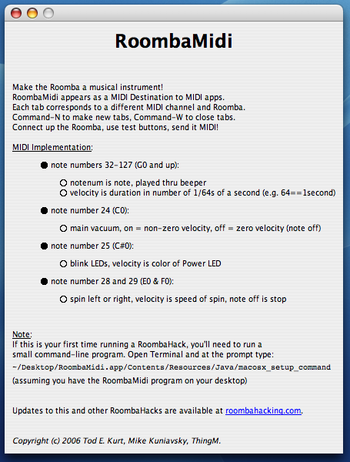 MAKE pal and Roomba hacker Todbot show you how use the Roomba as a MIDI instrument, maybe we’ll have this running at the Roomba fights – “The Roomba has a piezo beeper that can play tunes. You’ve heard it…….